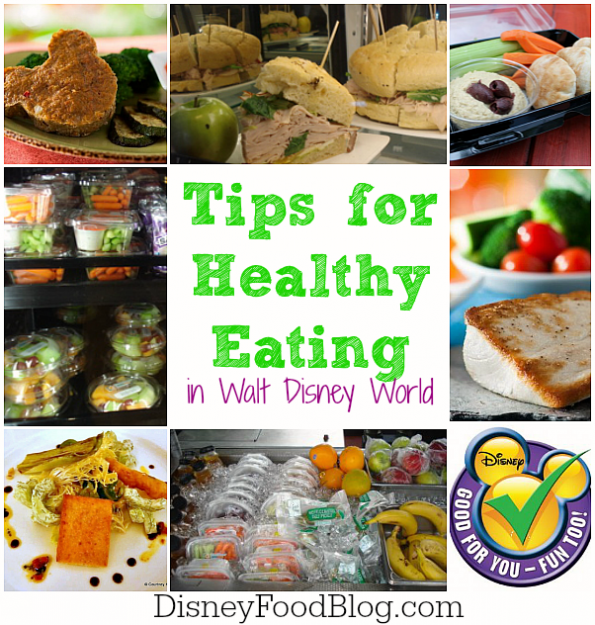 Some of you listened to the Healthy Eating in WDW episode of the WDW Today podcast last week, but there’s still a lot of information and tips for those of you who’d like to — or have to — start eating a bit healthier while you’re on vacation. Even if you just want “not to go overboard,” (I feel your pain.) the tips, menu options, and “eat this not that” suggestions will help! First thing first. These are tips everyone already knows, but we sometimes need a reminder or two…or three. Look for fresh, not processed foods: You can find fruits and veggies in every theme park. When you’re in a resort food court, consider a salad, boiled egg, or pita and hummus. Learn to be a “bother:” Order sauces on the side, substitute veggies/fruit for fries, ask that your meat not be cooked in butter, or see if you can order a half-portion of an entree for less money. Watch portion size: Disney likes to give you your money’s worth when it comes to food, so be aware when you order. Make a meal out of an appetizer, and when you splurge on a rich entree or huge dessert, share with someone else at the table. Eat breakfast: Breakfast is going to be one of the easiest and cheapest meals to eat healthily in a restaurant, so book mid-morning breakfast ADRs and fuel up with eggs, veggies, and wheat toast. Plus, there’s no temptation of ordering dessert! Call ahead: If you’re eating at a set-menu restaurant or want healthier, or no-sugar-added dessert options, call or write to Disney ahead of time (SpecialDiets@DisneyWorld.com, or 407-824-5967). …there’s going to be something there that won’t eventually kill you 😉 Here are a few menu options for table-service, parks, resorts, and counter-service dining. Teppan Edo, Epcot: Hibachi-style cooking. Consider fish or chicken with veggies. 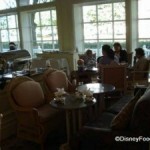 bluezoo (Swan/Dolphin), Nacroossee’s (Grand Floridian), Coral Reef (Epcot): All have light fish/seafood dishes. Kids’ Picks offerings make it easy for kids to have a healthy meal — choices include carrot sticks, grapes, apple slices, applesauce, jello. Grown-ups, you can often find grilled chicken or rotisserie chicken offerings. Also, check for veggie burgers, turkey sandwiches or tuna pitas, wraps, and veggie flatbreads. 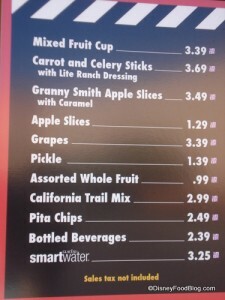 Options in the parks include: Fresh Fruit, hard and soft pretzels, whole pickles, turkey and veggie sandwiches, no-sugar fruit bars, bags of nuts, Chip and Dale’s food line (nuts, pretzels, dried fruit), fruit cup, dole whip. Disney’s Resorts are usually where you can find the most healthy options for grab-and-go. Most resorts have a quick service area with yogurt, cereals, fruit, veggies, sandwiches, milk, and other healthy options. Check the food courts and gift shops for these. Home-away-from-home (Villa) resorts also will carry deli meat and cheese, whole grain bread, and other picnic items. Consider having a healthy picnic on the Boardwalk instead of grabbing burgers at a counter-service place. I debuted the Disney World Version of Eat This Not That on the WDWToday podcast, but there were a few combos I didn’t get to mention. Don’t have nutrition info for most of it, but what I do have, I’m posting! By the way, this is for those of you who don’t want to completely deprive yourself of some good-tastin’ stuff, but still want to make better choices overall. Have a Dole Whip: 1/2 Cup Prepared, Calories: 80, Fat: btwn 1 and 3g (differing based on sources). 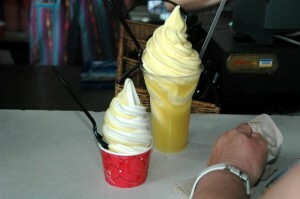 Note that the usual Dole Whip serving is more than a 1/2 cup, but even with size, you’re saving on fat calories. So, you can see that Disney’s made huge strides to improve the availability of healthy, fresh items for their theme park, resort, and restaurant guests. There really are some gorgeous, delicious dishes available that won’t mess with your heart or pack on the pounds. Do a little bit of research, look at menus ahead of time, and go in armed with some will power. You should always have fun on vacation, but your choices don’t have to be ALL bad. 😉 Enjoy! Great column about this topic AJ. Eating at WDW is like being on “temptation island” and while there are some healthier options, they aren’t as easy to find as the 1000 calorie turkey leg. I totally agree about being a “bother”. You should definitely ask for food the way you like it cooked or without the fattening additives like sour cream or butter or whatever. Great information…and advice! Thanks for bringing to us. I heard that all of the hot dogs were going to be chicken… true? If so – YUCK!!! Can’t they at least leave Casey’s alone? Splitting is always an option. Even when I was 50 pounds heavier, a whole turkey leg was too much food for me, but it was comfortable to split with my wife (and a whole meal at 500 calories isn’t bad by anyone’s standards). You’ll probably get charged a fee for an additional plate at a table service restaurant, but that’s not a problem for quick service. Matt — Thanks. “Temptation Island,” no kidding. I’m a person who “lives to eat,” so it’s nice that Disney has a lot of moderate choices that are still enjoyable. Whether I make those choices…that’s a different story. Lori — Glad I could help! Lots of great veggie items, too! Eeyore — Yep — the hot dogs are now a mix of chicken and beef. You still get some beef in there, at least. I hear you about Casey’s — there’s something special about a Casey’s hot dog, to be sure. Erwin — Thanks for the confirmation and notes from your experience. Eric — You bet! You can at least try and be “aware.” I always enjoy my food more when I do that anyway. I tease about gaining weight on my November Disney trip thanks to your great posts but with many trips under my belt (pun intended), I have yet to gain weight while at Disney. Part of that is all of the walking but most of it is about making better choices. I love that I can get fruit for a snack credit at Pop (although my husband and older son manage to always use all of our snack credits, leaving me without)! Of course, thanks to your blog, I have many more food stops to fit into our trip! Great post! I haven’t had a chance to listen to the podcast yet … I’m running about 4 episodes behind. At Beach Club Marketplace, we were so pleased to find the deli sandwiches you mentioned — it was a quick, filling and hot lunch (they will toast the sandwiches for you) that left me feeling much better than a cheeseburger would have. In the spirit of full disclosure, however, I did eat a cheeseburger at Beaches & Cream the next day that left me feeling pretty happy as well. 😀 But at least I made better choices on most days, which was my goal! Great post and lots of good, workable ideas. You obviously you put a lot of work into this post and into your contribution to the WDW podcast. Now you’re singing my tune, AJ! GREAT article! I love that there are so many great, healthy options at WDW that go beyond your basic, boring salad. I would never have guessed that a Dole Whip was such a healthy snack. Shayne — Thanks for the reminder about the deli sandwiches at Beach Club. That’s a great addition to the list! Chris — Thanks for your comment. I think this topic is pretty important — I’m thinking of adding an Eat This Not That column to the blog. Maybe every month or so. Gray — Thank you! There are more and more options every day; especially in table-service dining. If you have other ideas for good, healthy eating choices in the World, let me know! Dole Whip good for you?? Stop the presses! That’s great news! I also love the apple slices that you can get in the parks. They’re usually kept chilled and can be a great cool snack on a hot day. Confession time! We spend most of the year counting calories and maintaining a healthy diet, but when we are prepping for a Disney trip (and usually our stays are for 10 days!) I lose a few pounds in advance and let go at Disney! But I can attest to seeing Joe take advantage of the many healthier options available, and over the past 10 years we’ve been going, there are indeed many, many more options. Sunshine Seasons at Epcot was a great addition and offers alot of really good selections. Forgive me….it’s a disease…..addiction….I can’t help it! Jen — Those apple slices are usually my go-to treat! Annette — Ha ha! Ice cream fest! Perfect timing! I’m planning my long awaited return trip to WDW and am trying to wrap those plans around a wife with a very specific, healthy diet. This helps immensely! Great news, Jason!! Also, just checked out your blog — looks great! Can’t wait to see your posts about your upcoming trip! We leave in 34 days. Since our trip last year I have lost 107lbs. Now I’m not just worried about the calories/fat but the sodium. I have gotten good at making low cal/fat choices but all the hidden sodium is as scary as the tower of terror. I have the advantage of little kids (to share with) We are on the DMP so i have plenty of options and we are doing a lot of buffets. Any suggestions. maybe a future blog? Nicci — HUGE congrats!! That’s an awesome accomplishment (pls share secrets!)! YES, the low-sodium blog is a great idea. I’ll put it in the queue and start doing research. Is that last photo a machine with salads, like the ones with soda? Do they have this on the parks?? Please, answer me if possible through email! I’m a Californian with a long history of going to Disneyland. I’m baffled why the selection of food at Disneyworld is so poor compared with Disneyland. Disneyworld it’s hogdogs, hamburgers, pizza and assorted sweets and sodas. At Disneyland there is so much more to choose from. It felt like nothing but overpriced junk food, but when I compared the various restaurants, I was right. Has anyone else noticed this? I really appreciate this topic! 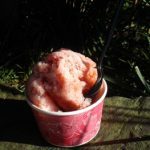 I went to WDW for a week early in the summer, and came home a few pounds lighter, despite treating myself to huge ice creams every afternoon (except for the Dole Whip day)!! I ate all those good salads that you mentioned. Yak & Yetti’s Mandarin chicken salad was good. Pinocchio’s place in MK had a good counter service salad too. Epcot’s Japanese quick service had a chicken dish with veggies over white rice that was also good. I took fruit with me for snacks, a pack of 100 cal pretzels, maybe a single granola bar. I didn’t feel at all deprived, and did not have that weighted down too full feeling. Thanks again for your post….more please? Yak and Yeti also has these delicious lettuce cups- minced chicken breast with water chestnuts in some time of yummy sauce with shredded carrots, bean sprouts and Hoisen sauce for topping! Yum! A cool and healthy treat that’s filling too! 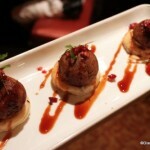 Reading this food blog and looking at the pictures is my daily treat. 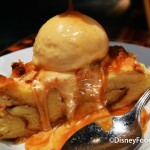 I’ll be going to Disneyworld in about three weeks and can’t want to sample some goodies in person. Like Nicci mentioned above, I have to watch my salt intake. I have Meniere’s disease and too much salt will have me spinning-no tea cups needed 🙂 Knowing that fruit & veggies are available is great! If any one in this blogosphere has any more unprocessed food ideas at the mouse house, please share! Hi! Maybe you can tell me…. how would you suggest a vegan survive a day at Disneyland? I’m mostly interested in Disneyland in California and EuroDisney near Paris. It seems a lot of restaurants (in general) think a vegan can make a lunch out of a tiny salad, but we need over 2000 calories a day just like everyone else! Especially if you’re walking around all day. What would you suggest? Kendal — My suggestion would be to dine table-service as much as you can, and make sure to speak with the chef to share your diet requirements. He/She can then create a meal for you that fits your specifications. Counter-service can be difficult as a vegan, though it’s getting better. Check out the menus at counter-service locations before you go to see what might fit the bill. Buffets might also be a good option, as you’ll be able to eat as much as you want of the foods that fit your needs. Thanks! Glad to know they can be flexible. I’ve only been to Disneyland and Euro Disney once each, several years ago, so I’m not familiar with the restaurants there, but next time I go maybe I’ll look them up and figure out who’s got the buffet or something ahead of time. 🙂 Although I’m not sure the French know what a buffet is…. As far as contacting special diet, here is the fact I cannot stress enough. Know your menus, know what you’d like to have adapted, and if you get a form letter back special diets telling you that it can be managed when you arrive, call. Speak to a human, and let them know that you have some very specific requests. Especially when you have allergies as well as dietary requirements. I got the form letter and let it go on my last trip. I had a few great meals, but there were issues. 1. Some restaurants/chefs are much better at this than others, and you won’t necessarily know the difference in advance. 2. ALL the chefs I have dealt with have said their job is easier with advance notice. 3. Even places that handle on the fly custom requests well, there can be a delay between your food and the rest of the table. Worse, especially for those with kids, is if they delay all the meals coming out. Advance notice can alleviate this. So, if you get the brush off initially, because your needs seem “easy” be politely persistent. I’m a weight watchers member who is going to Disney World in December. Is their anyway to find out nutrition labels for some of the foods, because I still want to eat what I like, I just would like to focus on portion control at the parks. Thanks! Kristin — Most packaged foods will have nutrition labels. If you’re at counter service locations, you can ask a manager to see the nutrition book, which may or may not give you ingredients and nutrition information. It can be tough to find nutrition information for table-service options and many counter service options, though. Are the WDW parks ever going to consider gluten free menus? Right now all I can eat at the parks is salad (no croutons) and possibly a chicken breast. 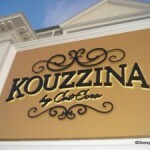 I was told that I would have to go to one of the upscale restaurants to get special orders. Help. Need low sodium options for the parks. Any ideas on how, where or what to order? If I request, will it be honored? I can’t eat wheat, rice, corn, (any grain really), sugar, or fruit (too much sugar, natural sugar, but still too much for me to have). I’m looking forward to every part of my upcoming trip except trying to finding something I can eat. I did contact dietary services. I got the form letter. She didn’t understand at all what I can and can’t eat. She said just talk to the chef when you arrive. Didn’t even address my questions about CS meals. I wish there was a checkbox for low carb when you make a reservation. Sugar free is not always low carb, in fact, it often isn’t, and gluten free (for which I’m seeing a lot more choices than there used to be) is still usually an alternative grain I can’t have, and probably has sugar as well. Can be good in addition to listing what you can’t have, letting them know what some of your favorite safe foods are. Which meats, veggies, what they can use in sauces, spices that you like or don’t like. Most likely, they’re going to have to make up a special meal for you in the kitchen, and these things can be helpful. Definitely stress that what you have going on here is a multiple allergy, multiple complication issue. Don’t worry about phrasing it as low-carb particularly (sounds like a choice diet and it’s not), but rather a multiple food allergy, sugar and gluten, etc. Thank you, Geanie! I’ll give them a call! You’re right it’s not just a choice, and I want to feel good while I’m there! Is there by chance an updated version of this? Have there been any more healthy options since 2010 when this was written. Wish there were more organic options. I’m a celiac and they are amazing with accomodating -but, wish there were more organic options…and a few more gf snack options. Like Sara, half my family is on a low sugar diet. Would you consider doing a blog on that someday? As always, fantastic job on your research!! Need to have low sodium diet. What are some healthy choices or restaurants that will offer this? I am on a low sodium diet for Menieres disease. I would love to see more info on how to get low sodium options at both the fast food and restaurants at Disney.